As someone who has a lot of experience with jack screw failures ( mostly overtravel and getting jammed), i cant think of a reason why after continuously trimming for 10 minutes , the pilots stopped trimming ? Even if the jack screw gets jammed , if limit switches/encoders are not tripped , trimming reference to the motor should still have been recorded. But strangely the pilots stopped trimming ? Any theories ? Did they think that their trimming was causing the stall warnings ? I worry that in the future we may have the opposite of what happened in this accident. A pilot (let's assume flying at night, with cloud cover), finds themselves thinking their IAS and AOA sensors are whack and hits the cutoff switch for the auto trim, when in actuality the IAS and AOA were correct, and they are now approaching a stall instead of what they perceive to be the plane trying to nose itself into the ground. While there didn't cutoff the sensors, this is basically what happened to AF447: there didn't trust the IAS indication anymore. This is why pilots have since more training to aviate with unreliable air speed. From my point of view, actual redundancy practice in aircraft is obsolete and must be replaced by predictors that take in account all available information on the aircraft. That's where defaulting to power/pitch control comes in. It's as close to VFR as you can get without looking out the window. It doesn't rely on any outside factors for information. If you had a phone or a pad with a bubble level app on it, if you were careful, you could fly with that information and throttle position. 1. Maintenance prior to the flight - why did the AOA sensor repeatedly fail? 3. How was MCAS certified (without cutting out when encountering unreliable inputs)? Loss of airspeed/AOA information can be fatal if badly handled anyway, throwing a runaway horizontal stab into the picture seems crazy. 4. Why weren't MCAS changes communicated to pilots? Rectified by the AD earlier in the month. Boeing is basically throwing everything at #1 and #2 whereas it's #3 that worries me. Deflection is not the kind of attitude to safety I want to see from an aircraft manufacturer. There have been concerns about the Boeing tail wagging the FAA dog for some time now, for example the Lithium Ion batteries in the 787 - in which the FAA were called out by the NTSB. They got away without causing fatilities there by sheer luck - not this time. I imagine we'll see US pressure on the Indonesians to keep quiet on that. 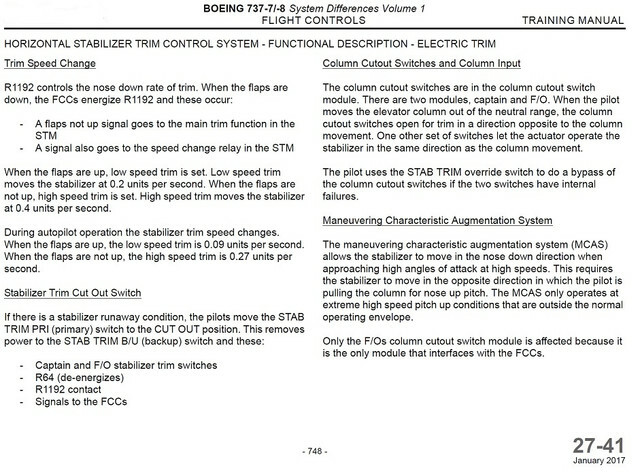 Did Boeing ever define criteria for what constitutes a "runaway stab trim" in their flight manual? I must say that this trim system with a lot of switches and a few relays plus what ever is in the motor itself would not seem to be out of place on a DC-7 or Connie. I guess if it works don't change it. I'm not excusing Boeing for anything but so far, nobody here knows what kind of testing Boeing did for the MCAS system. Presumably, it was flight tested. Unfortunately, it is impossible to test for every single potential failure mode. Boeing's 737 rudder hard over and RR's fuel icing problems got through because the failure modes were never predicted and only discovered after a accidents. There are many other examples. I think the odds that Boeing just cobbled the thing up and threw it on the MAX, are pretty darned small. That being said, if they did recognize the problem and did nothing about it, that's a totally different issue. I don't know if a such spectacular example is possible, but it would be a major blow to the current industry ! How can a apps on a phone maintain an aircraft in flight without any external sensor, while current automation try to kill everyone on board if a single external sensor fail ? I think the odds that Boeing just cobbled the thing up and threw it on the MAX, are pretty darned small. That being said, if they did recognize the issue and did nothing about it, that's a totally different issue. That is exactly no answer to my question. The question is not what, but how. How does the switch disconnect the trim motor. Does the positive power flow through the switch and throwing the switch isolates the motor electrical. Or does the cutout switch works on a contactor that cuts the power to the motor or does the cutout switch tells a computer or circuit to cut off the power. Fadecfault has kindly posted this before which answers your question, refer to the bottom LH side which tells you exactly what happens when the cutout is used. Why and how are pilots stating they knew nothing about it? Did they not receive this manual, or is it because it's buried 748 pages into the document? If the report is correct that the pilots of the prior flight used the kill switches, then that is obviously what they did .. replaced a motor driving the trim wheel with a hand turning it for the duration of the flight. Not as sophisticated but works the same except you have to "hand fly" the airplane. So do I understand correctly that the crew on the previous flight flew it with AP off, AT off, and trimming the airplane by hand-turning the trim wheel? "You're sitting. In a chair. In the SKY!!" ~ Louis C.K. Every modern aircraft of any size since the at least the 40's ...jets and private .. have had some form of motor driven trim probably at first to give the autopilot a method to control the pitch trim and maintain a constant altitude. And several instances and accidents mentioned in this thread have been caused by this "electic/motor trim" .. "running away" due to one fault or another. It was common enough and disastrous enough that designs were incorporated to stop it if it occurred. All of this is a way of getting around to the point that I would be very surprised if you asked a group of pilots and they didn't know what "runaway trim" was. It's been known to happen for years.This flight had all the symptoms of trim failure and the fix was documented .. use the kill switches. One group of pilots did .. unfortunately another did not. My take on the matter .. and I am a pilot .. is that is exactly what happened. Something I noticed ... apparently with flaps out, the trim didn't runaway, it was only after retraction to flaps 0. Could this whole thing could possibly been avoided by leaving the flaps out and returning to base with a flight control problem? I don't see how the final report could avoid covering in deep (as in the QF32 report) the safety assessment activity of the MCAS. Otherwise it would be a scandal as the failure mode officially published in the EAD is within the domain of the simplest mode of failure possible. Not covering this would affect a lot of credibility. But before the final report will be out, I feel that the actual silence about this critical point is already feeding a growing trouble. It would appear so, but the captain's displays would seem to still be affected and his stick shaker would have been annoying. edit to add: What you would be essentially doing is using the flaps as a substitute for not using the cutout switches. Last edited by airtechy on Wed Nov 28, 2018 6:33 pm, edited 1 time in total. However in case of 737, there is speed trim system(STS). I think it’s safe to say; it wasn’t a clear-cut “execute the Trim Runaway” checklist situation for the crew. All 737 MAX crews now know this is the thing to do in the above situation. But these crews didn’t have this information. Secondly, MCAS operating off a single AoA signal will not be for long. Without a better description of how either the STS or MCAS feels in the control column, it's hard to say. However, unless the feel is taught in the simulator, how many pilots have actually had it operate in flight? After all, it is a stall protection system and hopefully it will never be needed .. as I understand it. Therefore, if the trim is doing anything strange it would seem the best thing would be to kill it with the cutout switches and ask questions later. I'm sure that runaway trim can be caused by other failures than described here and in the flight manuals. That's why the "universal fix" is to disable it. Maybe Boeing tried to cover all trim failures with one description in the manuals. I'm sure the lawyers will have a field day on this. Last edited by airtechy on Wed Nov 28, 2018 6:49 pm, edited 1 time in total. I don't know if the question from way upthread was every answered; is it possible for pilots to manually control the aircraft against full down trim? Don't know the answer for sure, but the FARs for Part 25 aircraft don't seem to have a requirement other than "nothing shall break". There are stick force limits (125.143), but these are geared towards specific maneuvers and don't apply during transients, upset recovery, etc. The NTSB has recommended stick force per g limits, but by and large it doesn't appear that the FARs have been updated in this area in 50 years. Even if they thought the intermittent trimming was normal STS inputs, they countered it with their own inputs 20+ times for 6-7 minutes, and then just stopped and let the computer trim the aircraft to an un-recoverable nose down attitude. I think they will find that there was a change in which pilot was flying, and the pilot who took over the controls near the end did not have an instrument scan that was sufficient enough to keep up with the counter-trimming that was required. Having been involved in many failure analysis's .. sometimes with very limited data to work with, I feel for the Boeing engineering team .. hardware and software .. that's trying to figure out what caused the 20 degree mismatch error that disrupted several systems from occurring in the future. I'm sure they have a lot more data that is not public. Even thought this failure seems to have been repeatable between flights, it would be much worse if were an intermittent failure! Been there done that. It would be interesting to know how any possible fix will play into the certification of the plane. From the FDR trace, it does indeed look like the captain relinquished control to the FO, who, it appears, stopped the trimming by hitting the manual electric button, but then didn't follow through with the crucial step of re-trimming nose up. Why he didn't react to the increasing column forces (other than by muscle) is anybody's guess. Maybe he was responding literally to an (incomplete) instruction from the captain? That accident investigation report noted by Zeke way up thread is a fascinating and scary look at the variable training quality in parts of the world. Last edited by dakota123 on Wed Nov 28, 2018 7:18 pm, edited 1 time in total. To me, from a process standpoint ... if you "do something" and something unwanted occurs as a result ... and you "undo that something", and it goes away ... then you don't repeat doing that something. ... something is amiss here in the logical thinking/procedure of the assessment and problem solving. "MCAS operating off a single AoA signal will not be for long." What does the hive mind think ... should it automatically disable if there is a discrepancy between the two AoA sensors, or should it be selectable which sensor it uses? or both? I am developing the sense that there is one master switch needed. it would OVERIDE everything automated (except the TCAS of course!). and permit (compel if you wish) immediate return to hand flying. No diagnosing, no trying to fix the problem, just fly on and discuss after landing at nearest airfield. And if the Max won't so fly better than a brick, then shame on the manufacturer and certification folks. Last edited by sgbroimp on Wed Nov 28, 2018 7:24 pm, edited 1 time in total. I know what that means literally, but I'm not sure I understand what the impact of that is. How is it effected? 110-240V is still considered low voltage. What is important and good to see in the design is there is not just one mechanism, there is multiple paths where the motor is isolated, both on the control side and the power side. The cut off is only on the control side. Something called power cut off in my industry, would cut off power, not control only. You are probably referring to Lock out-tryout-tagout which is done prior to doing maintenance on a system in just about any industry including Aerospace. In industrial systems that have remote power relays do you remove power to those relays by pulling a main power circuit breaker every time you shut down the system? No. you shut down the system by way off the control. Where here we are not referring to performing maintenance on the S/T system, we are referring to the flight crew operating the aircraft and trying to make sense of a not normal situation. Last edited by stratclub on Wed Nov 28, 2018 7:46 pm, edited 1 time in total. In my experience with relays, I can't recall a failure where a normally open power circuit would stay closed when coil power is removed. I've had more fail than I can count remain open, and not close the power circuit on command. I'm not saying it's not possible...just that I haven't seen it and it seems like an unlikely failure scenario. If you study the trim system Zeke posted in post #1800, it appears that the FCC does only go through the FO's trim switch. What that means would require more study .. and better glasses. Maybe it has some significance. Makes you wonder why whatever it does wouldn't be the same for both the captain and first officers yoke. The AOA between the left and right were 20 degrees off even during taxi. Seems like a pretty simple system self-test would have been to check the agreement of the two angle-of-attack indicators whenever the wheels are on the ground. It was covered upthread that only read correctly after a certain speed .. min airflow, so that could be tricky. I was once tasked to review the design of a car anti-skid control part. It needed to have zero rate output when the car was not turning, but unfortunately had an unknown error that had to be nulled. I suggested they null it to zero when the car was started. Someone pointed out to me .. "what happens when the car is on a ferry?". I am disgusted by Boeing’s response as it is clearly factually incorrect. We know from the FDR data that airspeed and altitude were correct. MCAS was going off due to bad AOA data. The Boeing response also said the crew flying from DPS to CGK applied the procedure contained in the emergency AD. That emergency AD only cane out 3 days after the crash. They could not have applied that procedure as it did not exist as the time for that condition. Very poor form, clearly trying to distance themselves from what happened. Folks, Boeing would have the data from the previous flights sent to them by the aircraft. They knew what was going on. I think what Boeing is trying to say is that, they applied the correct procedure to counteract bad AOA. I’m pretty sure the Emergency AD was nothing more than a repeat of what they put in their manuals. Which is literally what the say in their statement. I could not find any reference for "relay sticking" in regards to mission critical aircraft systems, mostly hobbyist type design stuff like building non critical automation and control circuits. Anything used on an aircraft is well past the design phase and is thoroughly tested for reliability and failure modes at an individual component and systems level prior to being used on an aircraft then the aircraft design has to proven to the FAA by Flight Test validation prior to being put into service. The aircraft has two FCCs that have dual CPUs. I think each CPU should calculate the MCAS,STS,Mach trim commands from sensors on both sides, and have them agree between sides within the same FCC. Eg Left FCC CPU1 use left AOA, CPU 2 right AOA, Right FCC CPU 1 right AOA, CPU 2 left AOA. If they cannot agree between FCCs, see if they agree on the other FCC, if they agree on the other FCC swap the active FCC. If neither can agree, remove the automatic trim functions, tell the pilots they are not working. When MCAS, STS, or Mach trim is being added by the autopilot while being manually flown have a flag/FMA on the PFD. The 737 has two independent mechanical elevator flight controls; the left side which has its own cables to control a hydraulic PCU actuator which controls the left elevator (Red trace CCFORCE_PITCHCWSLOCAL_FDR in Figure 5) and an identical system on the right (Green trace CCFORCE_PITCHCWSREMOTE_FDR in Figure 5). The systems are joined in the cockpit via a torque tube with a breakout mechanism to get one elevator free, through a very high stick force, in case of an elevator control jam on one side. At Figure 5 (A) the traces are no longer following each other. The First Officer has taken over and his Yoke exerts a higher force to counter MCAS trimming. The Left pitch force remains the same as before. The two sides of the mechanical flight control system are now independent. It seems a Yoke breakout has occurred. Last edited by Finn350 on Wed Nov 28, 2018 8:37 pm, edited 1 time in total. "When the R2-5 relay was recovered from the wreckage it was subjected to detailed examination. Two stuck contacts within the relay were identified"
Last edited by PixelFlight on Wed Nov 28, 2018 8:38 pm, edited 1 time in total. 1. As LDRA pointed out it's hard to reconcile the MCAS system with the certification requirements detailed in Part 25 Section 25.672. 2. It appears that MCAS remains operational even after it's established that one of its inputs (AOA, Airspeed and Altitude) is erroneous. This seems like awful design to me - at the point a pilot might have to fly pitch and power you have some system arsing round with the pitch? On the other hand, if it's turned off pitch stability is degraded - apparently only an issue at extremes of pitch and airspeed right at the point you might have erroneous indications of them. It just seems like a bad idea - surely there were safer options (enlarged horizontal stab? 1 frame stretch forward of the wing?) even if they were more expensive - surely that's where the FAA steps in. These are reasonable questions that need to be asked - it looks like Boeing is attempting to pin this solely on maintenance and pilot error, which is pretty disgusting. There was no correct procedure as the emergency AD states that Boeing were only aware after they saw the data that an unsafe condition exists when a bad AOA can cause MCAS to trim nose down at much lower speeds than designed. This was not in the manuals. We had a pilot earlier on this thread who stated that MCAS was not even mentioned in their MAX differences training. They regarded MCAS as such a trivial change just to mention it in briefing or a PowerPoint slide is considered good enough to expose the pilot to it. No pilot had been trained or made away that MCAS could trim so far nose down it can kill you. So no, Boeing are not repeating what they have said before. How do you come to this conclusion? The FDR data seems to show a 20-30 knot difference between left and right airspeeds. (Its difficult to tell because the scale is small). And, the pilots asked ATC a couple of times what the radar showed for their altitude and airspeed because they (the pilots) could not be sure because they had indication problems. There is already trim wheels spinning and increased control forces to maintain level flight when MCAS is making trim inputs. What does a flag do for you? I don’t agree with that, I had mentioned in a fairly recent tech ops discussion on another topic of a couple of incidents one in a 757 the other in a 747 where flight control cables became jammed they crews tried to force the breakout and were unable to do so. It also does not fit the data, if the local refers to the captain and remote to the FO, with more elevator being applied on the left than right it should induce roll to the right when the rolled to the left. Firstly from what was in the emergency AD, they only said it was bad AOA data setting MCAS off. The L and R IAS I see have the same small change throughout the flight, when compared to the standby none of them would be considered unreliable. My guess is they asked ATC for GROUND speed and Altitude based on previous history. Because the crew does not know WHY they are moving, the previous sector wrote up the STS as they thought that was doing the trim inputs. If there was a FMA message each time the trim is moved by the autopilot the crew can then decide if that is appropriate, and if it’s inappropriate report the correct issue. Would the crash had happened if the crew on the previous sector had known it was MCAS making the inputs and they made that entry instead of STS ? You need to re-read the AD I think. All the AD says is that if you have uncommanded stabilizer combined with this list of indications.... you must do the runaway stabilizer procedure (which was already in the manual). Now.... that means you have to recognize the stabilizer is making uncommanded movements.... and if you recognize that why wouldn't you have already complied with the procedure, regardless of other indications? This means only right elevator is controlled by the First Officer. Despite an increased force by him, the AoA is going down, meaning the right elevator cannot hold the nose up. Then the First Officer force is quickly lowered (can be a stick forward stall recovery action as the nose dips like in a stall) and the Captain’s force shoots up as the aircraft plunges. Will as I see it the minute anyone admits that what happened was in fact a "runaway trim" or a "runaway stabilizer" as the preliminary report calls it, there is a "procedure" for that .. the cutoff switches ... and so it's to some parties advantage to never let it be called that. Also, why anyone would need a "procedure" to correct for an obvious failure mode that can be caused by many things and has existed in all jet aircraft with auto trim for years escapes me. Would the crash have happened if the accident crew determined the trim movements were not desirable and used the cutoff switches like the previous crew? The previous crew recognized that the trim was pushing the nose over.... they didn't care why it was trying to do that, they just turned it off. The accident crew counter-trimmed the computer 20+ times and couldn't come to the same conclusion? It’s most definitely at least in the manual. That is from the Boeing Engineering course notes. The Engineers take a two week differences course from the NG to the MAX, plus practical training. Pilots get a hand out.